You have been reading a lot lately about blogger events and challenges issued. It is one of the best things about being a food blogger in Boston. A few week’s ago, Cara of www.carascravings.com, issued bloggers a challenge and an invite. The challenge, create a unique dish based on the elements of a sedar plate. The invite, come share all of your creations at a get together at Cara’s home! Well, when you say sedar plate, I say charoset. Period. Which means I failed in the creativity portion of this challenge. BUT, I did so on purpose. My thought was that if I was going to meet with people who had possibly never been to a sedar, I was going to get traditional charoset in front of them darn it! You can read a full recap of the event, food, and fabulous attendees here, but let me just tell you, it was nothing short of phenomenal. I will say that having seen the amazing dishes the other ladies brought, I did feel a little sad that I didn’t flex my creativity more, but I got over it after 5 helpings of charoset and everything else on the table! In case you aren’t clicking through to read about the rest of the event, let me recap the other dishes. There were Deviled Eggs from Megan, Cauliflower Latkes from Melissa, Matzoh Crusted Asparagus w/ Hollandaise from Amanda, Massaged Kale Salad from Elina, Crunchy Apple Slaw from Jen, White Chocolate Wasabi Truffles from Shannon, and our host Cara provided Spiced Lamb and Eggplant Matzoh Crepes and Almond Chocolate Dipped Meringues. Are you jealous yet? The day was so much fun, and I can’t wait for the next challenge and get together. I promise to be creative for the next one. I just feel a certain way about charoset….get it whenever you can! Add the remaining ingredients, feel free to adjust measurements to your taste. 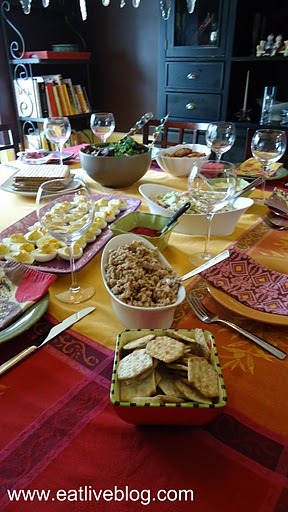 This entry was posted in Recipes and tagged appetizer, charoset, matzoh, passover, recipe, sedar, side dish by reneeh. Bookmark the permalink. I’m sooooo sad I missed the potluck, I’ve still got a post for the Seder plate challenge though… It goes up this weekend. Also I want some charoset… it sounds awesome. I agree – everyone should experience charoset! it all looks so delicious and very professional. I am sure enjoyed every morsel of everything.